As I mentioned in my last blog, about depression, in order to explain why you are anxious, I have to tell you some things about your nervous system. In the olden days, pre-1995, before Stephen Porges published his Polyvagal theory, the world thought of the nervous system as “fight or flight,” or “rest and digest.” You were either ready for action or chilling out. Your nervous system, it turns out, is a little more complicated than that. Dr. Porges discovered that the “rest and digest” part of our nervous system has two branches. The “ventral vagal” branch and the “dorsal vagal” branch. One branch is the “social engagement,” very-good-feelings, branch and the other is the immobilization, or, “depressed and isolated” branch. Unless, of course, your “social engagement” system is online and in proper functioning order. This ventral branch of the “rest and digest” part of your nervous system is the part that allows you to calm down, be still, socialize, digest, eat, reproduce and feel safe with others. It’s the “brakes” for your natural mammalian need to be “on the lookout” all the time, and evolved because of our need to be able to be still and social to care for our young. This “vagal brake,” of social engagement is communicated through eye contact, facial expression, tone of voice, posture, gesture, intensity and timing, and happens on an unconscious level. It is what allows your body and mind to function optimally. You feel calm, confident, relaxed, and comfortable being still. If your social engagement system is out of whack, you are going to revert to one of two other possible states. Your body will either be hyper-aroused, always vigilant, always ready to fight or flee, or it will fall into the dorsal vagal state of withdrawal, isolation, dissociation, diminished breathing, body aches, and poor digestion. Or, you will constantly alternate between the two. The situations that switch your nervous system out of social engagement are those in which you are helpless, overwhelmed, or afraid of something inside or outside of you, emotionally or physically, for any length of time. You body first attempts to fight or flee. 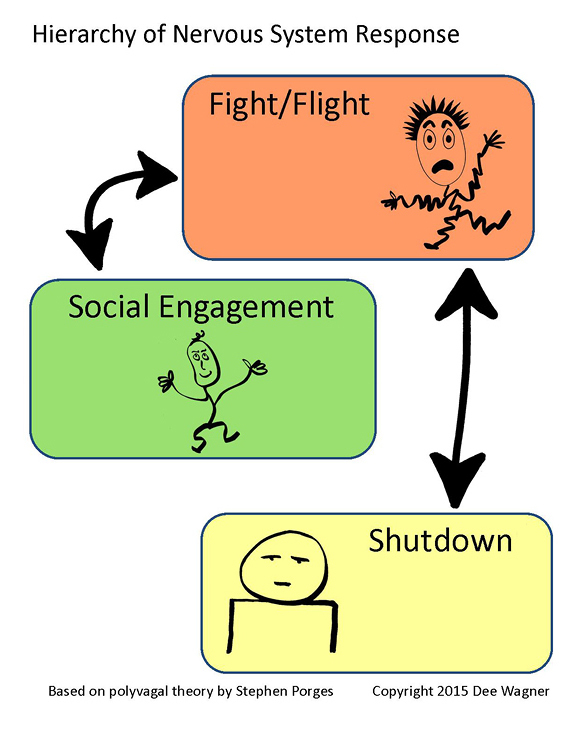 If you cannot fight or flee the circumstances, your body will go into a dorsal vagal state of shutdown. Obviously, anxiety is not the feeling you have if you have reverted to the dorsal vagal state of shutdown. At that point, you have dissociated from the feelings and do not feel much of anything. If you constantly feel anxious, can’t sit still, and have a short temper, you are living without a “vagal brake” on your baseline mammalian activation. Everything is a threat to your nervous system, and you are always on the lookout for danger. This is bad for your health and bad for your relationships. So how to do you change it? The same way you change anything in your body. Slowly. With lots of repetition. You stimulate your ventral vagus consistently through simple exercises like the ones in the book, Accessing The Healing Power Of The Vagus Nerve: Self Help Exercises For Anxiety, Depression, Trauma And Autism, and others; and you engage in regular contact with people who make your nervous system feel safe. Therapy happens to be one of those types of relationships, primarily because it’s a relationship that is designed to be 100% about your needs. Therapy also happens to be a relationship in which you learn tools to bring you out of your “fight or flight” activation, and uncover and “work through” the historical origins of your body’s habit of remaining in “fight or flight” activation. Uncovering and “working through” are, in essence, the practice of “mindfulness.” And mindfulness is a scientifically validated practice that is at the foundation of every path to happiness and peace-of-mind that exists. And now you know. That’s why you are anxious, and that’s what you can do about it. If you are interested in taking charge of your nervous system and building a strong foundation for your peace-of-mind and happiness. Give me a call. We’ll talk.